Here’s what’s happening in the world of television for Monday, October 1. All times are Eastern. Better Call Saul (AMC, 9 p.m.): AMC sure likes a tantalizingly vague episode description. People could be robbing a train in the middle of the desert and the description would be something like “Walt and Jesse deal with a supply issue; Todd meets a spider.” Well, despite this week’s vague promises—“Jimmy and Kim level with each other, while Nacho makes the rounds with Lalo and Mike has cause to worry”—we can all but guarantee that “Wiedersehen” is a not-to-be-missed, stay-off-Twitter kind of outing. 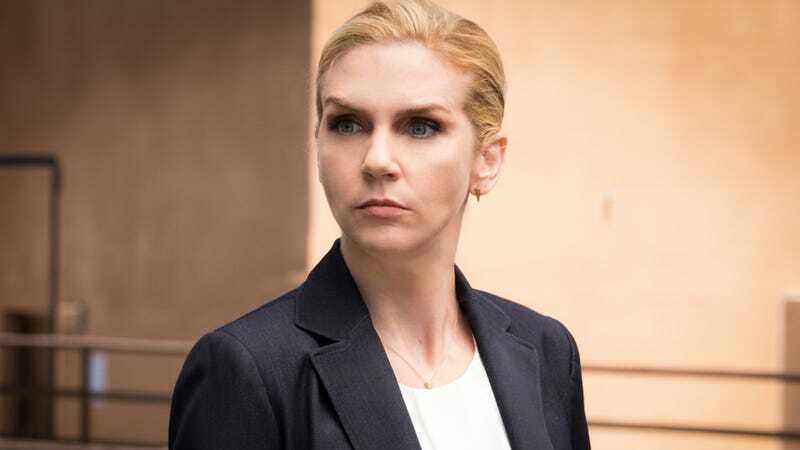 First, it’s 78 minutes long, and while that wouldn’t be a promising note for every series, Better Call Saul is the kind of show that rarely wastes so much as a moment. Second, it’s the season’s penultimate episode, and as it happens, Better Call Saul is very good at penultimate episodes. Donna Bowman stands ready to make sense of all 78 minutes. Us & Them (Sony Crackle, 3:01 a.m.): Way back in October 2013, Fox trimmed the episode order for its new sitcom, an American remake of the BBC hit Gavin & Stacey, from 13 to seven. Not a good sign. Then Fox didn’t even air those, and shelved the whole thing. So here’s your genuinely kind of wild Wild Card: Today Sony Crackle is releasing in full that shelved sitcom, which stars Jason Ritter and Alexis Bledel. It has aired outside the U.S., but never here, so if you’re yearning to travel back to the era of pre-Handmaid’s Bledel and pre-The Tale Ritter, now’s your chance. The series also features Michael Ian Black, Malcolm In The Middle’s Jane Kaczmarek, and BlacKkKlansman’s Ashlie Atkinson.